With more than 15 years of practical application in the industry! The products I use are high quality & my kits are all geared to suit sensitive skin where possible – though spfx makeup doesn’t always have that option. I also have ensured to stock high quality synthetic brushes, cruelty free & vegan products in my kit. Not everything I use is vegan, but if you are then I make sure the all products to be used on you are too. I can live-create as well as make masks & prosthetics. Please let me know exactly what it is you are wanting – every job is different & I quote to suit. The more intensive your makeup is to create, the more it might cost to make. If it’s only a single bullet wound or gash, I don’t want to be charging you the same as I would for a full body makeup with 8 prosthetic pieces that took 3 weeks to complete & takes another 4 hours to apply on the day it’s required! Live Create – 5 hours. Bald cap was made from scratch to fit model & hides his medium length curly hair. This is where the most time was spent – waiting for layers upon layers of liquid latex to dry. Full head face paint design for a comic/cartoon zombie, with realistic blood for juxtaposed effect. Photoshoot at completion took no more than 45 minutes! In 2009 I received my Certificate 2 in Make Up Artistry & International Diploma in Make Up for Film, Media & Theatre, graduating with a Distinction. That’s not where I started though – I’ve more than 15 years of practical application in the industry; mostly working in amateur theatre as well as photography, & student & indie films. I have experience in evening, wedding & special occasion makeups, high fashion, life casting, prosthetics, masks, stage production & film. 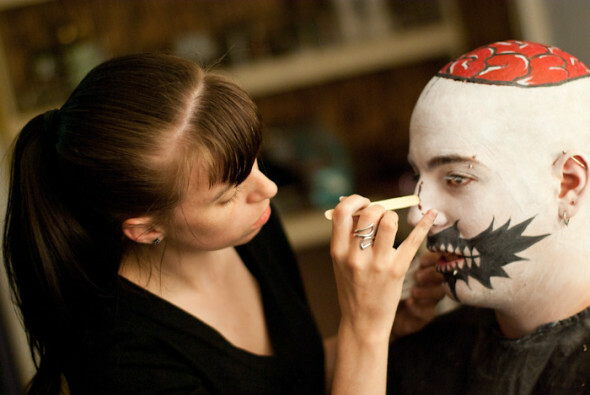 This includes the more gruesome dead-zombie look – wait, are there live zombies? Undead. He’s dead, Jim, but not as we know it! The costs listed on this page are per person & assume that your makeup will be done in Perth, Western Australia. If you live outside the Perth Metro area, don’t fret! I will happily travel to you, regardless of where you are. What’s the catch? You are responsible for my travel costs (& accommodation if necessary) as well as the cost of the makeup you’d like done. But if you want to look like your Draenei Shaman for BlizzCon & you want me to do it, don’t let the fact that I live in Perth stop you getting your wish! !